compliment of the season I am miss ann wade by name,your profile caught my interest and i want to be your friend, please reply me through my email (annakabrani@ hotmail.com) so that i will give you some of my pictures and tell you more things about me, i have a very important thing that i want to share with you. I am more than happy to read your mail today, like i told you in my first mail, My name is Ann Wade, age 25 year 51 kg about 156 cm from Cote D'Ivore in West Africa Presently i am residing in the refugee camp here in Dakar Senegal as result of the civil war going on in my country. My father Dr. Ephraim Wade was the personal adviser to the former head of state (Robert Guei) before the rebels attacked our house one early morning and killed him alongside with my sweet mother. oh? may their souls rest in peace, It is only me that is alive now and i managed to make my way to a near by country Senegal where i am living now. Please I will like to know more about you.your likes and dislikes and what you are doing presently age and your picture. I will tell you more about myself in my next mail. I am more than happy in your reply to my mail and the ability for me to trust you. How are you doing over there today?. Mine is a little bit hot weather over here in refugee camp here in Dakar Senegal. It's just like one staying in the prison and i hope by Gods grace i will come out here soon if you help me. i am using pastor computer. I don't have any brother, sister or relatives now whom i can go to, all my relatives ran away in the middle of the war the only person i have now is Rev Peter Samuel Faye who is the pastor of the (HOPE OF GLORY CHURCH) here in the camp, he has been very nice to me since i came here but i am not living with him rather i am leaving in the women's hostel because the camp have two hostels one for men the other for women.The Pastors Tel number is +221774605451 if you call tell him that you want to speak with ann so that he will send for me. You know as a refugee here i don't have any right or privilege to any thing be it money or whatever because it is against the law of this country. I want to go back to my studies after because i only attended my first year before the tragic incident which lead me into this situation. and also you have to know that everything i have tell you about my self is the absolute truth, am a very sincere and honest person, I am single and never married before. I want you to understand that age difference has not to do with us. Please listen to this, i have my late father's statement of account and death certificate here with me which i can send to you later, because when he was alive he deposited some amount of money in a leading bank in Europe which he used my name as the next of kin,the amount in question is ( Five point Seven Million Dollars) 5.700.000.00 million dollars. So i will like you to help me contact this bank to transfer this money to your account and from it you can send some money for me to get my traveling documents and air ticket to come over to meet with you in your country to proceed my Education. I kept this secret to people in the camp here the only person that knows about it is the Reverend because he is like a father to me. So in the light of above i will like you to keep it to yourself and don't tell it to anyone because i am afraid of loosing my life and the money if people gets to know about it. Remember i am giving you all this information due to the trust i have on you. I like honest and understanding people, truthful and a man of vision, truth and hardworking. My favorite language is English but very fluently. Meanwhile i will like you to call me like i said i have a lot to tell you and i will give you the information of the bank once i heard from you. Have a nice day and think about me all the time. Dearest, i thanks you once again for giving me hope of extricating from this problematic situation which am passing through ever since the abrupt death of my beloved parents, Honey am really grateful and God must Surely repay you in returns. Meanwhile I love you from depth of my heart, that's why I open up everything about my life & entrust my inheritance into your care. Note, I went into serious discussion with the Royal bank of Scotland Plc where this money is deposited into, for them to advise me on what to do in order to have access to my late father's fund, the legal department of the bank told me that in a situations like mine, that the best solution is by soliciting for assistance of a reliable foreigner who can assist me claim, receive the fund on my behalf as I wish. I then decided to contact you hoping that with your advanced knowledge we can be able to work together, Though it took me time to make up my mind to contact you and offered you this proposal of mine of which my whole life depends on. I have been directed by the Executive Director and Chief Operating Officer/Chief Financial Officer of the Royal Bank of Scotland Plc to write you in respect to your email we received to our bank concerning the wire tansfer of $5.700,000:00 US Dollars to your bank account Actually, we have been informed about you by the young girl Miss Ann Wade the next of kin of our deceased customer Dr. Ephraim Wade, that she wishes you to be her trustee/ representative for the claim of her late father's deposit with our bank. 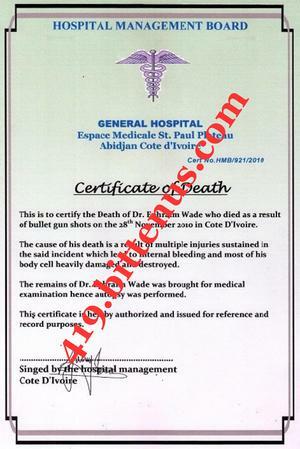 Her Late Father Dr. Ephraim Wade is our late customer with substantial amount he deposit with us before his death. Hence you have really been appointed as a trustee to represent the next of Kin. 2. A Power of Attorney document issued On your name permitting you to stand for the transfer as the nominated sole beneficiary of the total sum: Five Million Seven hundred Thousand United States Dollars. sign by the Next of Kin Miss Ann Wade from Federal High Court of Senegal. Note: The above are compulsory,and are needed to protect our interest,yours and the next of kin after the transfer has been made. As soon as the information's sent in to the Management of ROYAL BANK OF SCOTLAND PLC. Our Bank swift telex's wire department will commerce the transfer of the total sum to your providing bank account within the maximum of 24 hours once we confirm the documents made on your names. You are to contact your partner for more directives about getting a Senegal resident lawyer who will help to get the above mention documents for you. Please, If you have any question's regarding this transaction don't hesitate to contact Hon. Bruce W. Van Saun (Foreign/Director of Financer) Royal Bank Of Scotland plc. via our email and telephone number +447790278715 Call us between 10am to 16.30 GMT time in Scotland, UK. I saw the mail of the bank you sent to me, i read and understand they agreed you as my trustee, now about the request the bank needs from us the power of attorney and the affidavit of oath from the high court here in Senegal. 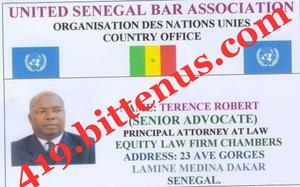 The Reverend father gave me the contact of this lawyer below, he is a registered lawyer in the United Nation Camp here and he is also a registered member in (Senegalese Bar Association) who will help in preparing the documents for us. My love, i will like you to please contact him today for the preparation of the Power of Attorney, when contacting him i will like you to send to him all your information that will be used to prepare the documents on your name in the high court of Senegal. That is your names, address, phone number and even your passport scan copy ok. Please try and contact me when you are in contact with him and let me know if he agrees to help us, l will like you to first of all get the money transfer to your account and from it you can send some money for me to prepare my documents to come over there to meet with you over there in your country and it will be my pleasure to come over there to continue my education, i am happy that the bank agrees you to be my trustee, have a nice day and think more of me the way i do for you. I remain yours forever in Love. Subject: SEND THIS MAIL TO THE LAWYER TODAY. SEND THIS MAIL TO THE LAWYER TODAY. TO Bar (Dr) Terrence Robert. I, Mr ...........................a permanent resident of ............Your Phone Number ........... Your Occupation................... wants to put forth the following few lines for your kind favour and quick necessary action at your end? that Miss Ann Wade, living in Dakar Senegal is in a refugee status, I am her foreign partner and will stand on her behalf as her trustee for the transfer of money from Royal Bank of Scotland to my bank account, i want you to prepare us some documents from the high court on my names. 2 An affidavit of oath. She is the only next of kin to her late father who has deposited some amount of money for her beloved daughter, I want to know the possibilities of assisting her to transfer the deposited amount of her late father of which she is the next kin to my account in my country, after receiving a reply from you, I will be able to know the procedure and probability of getting the documents . We are solicitors and advocates specialized on legal representation, estate recovery, debt recovery, estate management, constitution enactment advisers/reviewers, Company secretaries, financial advisers and other legal documentations/matters. Please note that I am in receipt of your request, I wish to thank you for accepting to use us. I wish to assure you that we give the best legal services to our clients. Now as requested by you for the processing of the documents needed for the transfer, I have acknowledged the receipt of your full data which shall appear on the power of attorney. I will proceed to the Federal High court with the death certificate for Attestation.will then swear affidavit of support to change you as the owner of the fund and then with this, the bank will now effect transfer to your bank account. Having said this,From the inquiries made at the Federal high court this morning, please note that all this service will be subject to the payment of our legal service charges. And also you are to pay the cost of oath fee including the Consultation/Mobilization fee, stamp duty fee and the notary stamp and authentification fee. Take Note: We have to receive this payment 1,030EURO before we commence operation. You are therefore advised to send finances to enable us pay oath fee, Notary and stamp duty fees. To do this, you will have to send the money through Ria Money transfer or MoneyGram Transfer office today with My secretary name and address therein. Upon the receipt of the said amount we will commence the processing immediately, Which will be ready in two working days. We once more thank you for your decision to work with our chambers as we assure you of the best service. Scan and send the receipt of payment as soon as you sent the money confirmation and easy collection. I'm happy to inform you about my success in getting the fund transferred under the cooperation of a new partner from Russia. Presently I’m in Russia for investment projects with my own share of the total sum, that is why i never send you mail, Meanwhile, I didn't forget your past efforts and attempts to assist me in transferring those funds despite that it failed. Ask him to send you a certified bank draft of $120..000.00 which I prepared and kept for your compensation for all the past efforts and attempts to assist me in this matter, I appreciated your efforts at that time very much. So feel free and get in touched with Rev David Samson and instruct him where to send you the money, try and send him your address and your contact. Please do let me know immediately you receive it so that we can share our joy after all the sufferings at that time. In the moment, I am very busy here because of the investment projects which me and the new partner are having at hand, finally, remember that I had forwarded instruction to Reverend father on your behalf to receive that money. Therefore feel free to get in touch with him and he will send the amount to you without delay. Take care and bye for now.